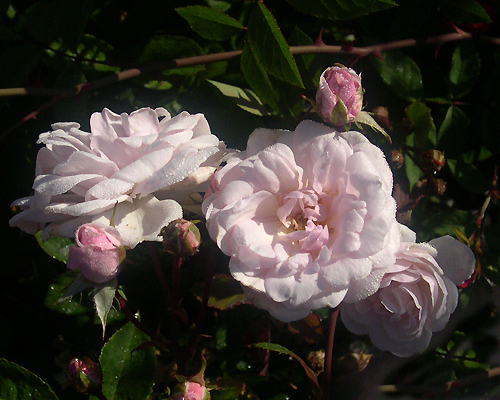 The Polyantha class of roses contains many excellent Garden Roses. They are hardy, tough, lower growing and bloom all season. This is “Marie Pavie”. There is one simple rule to keep in mind when selecting which Garden Roses you want to plant. What do you want it to do in your garden? As I mentioned in Part 1, Garden Roses come in all shapes and sizes. Because of this you select them like any other plant. By their use. If you want a hedge would you buy maple trees? No, you’d buy a bush that makes a hedge. If you want to shade your house would you buy an azalea? No, you’d buy a tree. It’s the same with Garden Roses. If you want a rose to climb on an arbor then you need a climbing rose. If you want a rose to make a hedge you need a tall shrub rose. If you want a rose to spill over a wall you need a groundcover or a draping rose. Before you get seduced by the pretty photos of the blooms think about what you want the rose to do. We work with a system of eight different growth sizes that may help guide you. As with any system there are nuances within them, but it’s a good start as you begin to think about where to use them in your garden. Groundcover. These grow along the ground and generally mound, staying under one foot in height. Small Shrub. Shrub roses up to three feet in height. Medium Shrub. Shrub roses three to five feet in height. Large Shrub. Shrub roses over five feet in height. Some grow in a sprawling, or arching pattern, and can get quite wide as well. Large Climber. Climbing roses over fifteen feet in height. Local information is a great source. You can also begin to narrow down your search by knowing a bit about the various rose classes. That’s right; roses are divided into classes like Hybrid Tea, Floribunda, Gallica and so on. Taking the time to learn a little about each will really help you. Lastly learn the names of the Rose Breeders who created the roses you are hearing about. Just like authors, musicians and artists chances are if you like one piece of their work you’ll like the rest! From here we suggest you go to Part 4 of Roses 101.